Medical assistant Loren White pets Minnie, a labradoodle mix, during a Pet Pause session at Rush. The notion of using therapy dogs to help patients cope has been around for decades. 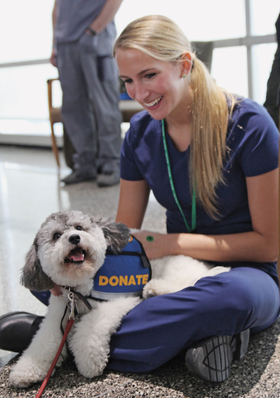 But now doctors and nurses at one Chicago hospital are the ones de-stressing by playing with pooches. Three huggable pups named Rocco, Minnie and Dallis greeted almost 100 white-coat and scrubs-clad visitors at a recent animal therapy session at Rush University Medical Center. While the dogs happily accepted cuddles, ear rubs and treats, the big grins on the human faces suggested the feelings were mutual. Minnie, a fluffy white and gray labradoodle mix, had “the softest fur I’d ever felt, like a little cloud,” nurse Ben Gerling told the Associated Press as he headed back to work. Inspired by a similar program at the Hospital of the University of Pennsylvania, Rush has held the monthly Pet Pause sessions for over a year, using dogs from a local shelter and an animal therapy group. Rush nurses have launched a study to see if the program alleviates worker stress. In the study, the human visitors get blood pressure measurements and fill out questionnaires rating their stress levels before and after the canine cuddle sessions. Research in other settings has shown benefits from interacting with animals, including lowering stress hormone levels, blood pressure and heart rate. “My blood pressure was kind of high when I came in, and it was lower when I left by about 10 points, so that was good,” he said. For Benjamin Gonzales, a graduate student in health systems management at Rush, the heavy course workload can be taxing. He called the dog session a welcome break—even if his blood pressure was a little higher afterward.